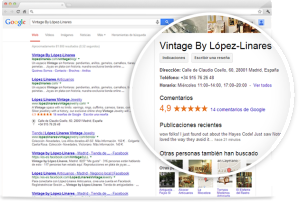 Google My Business manages the information of your business displayed in Google Maps and Google+, feeding and enriching the Google Search results. Google My Business is a free tool, so that everyone can easily update their business information. That is why optimizing it is extremely important to stand out amongst your competitors. I will be glad to evaluate and improve your presence in Google. I can help you from the creation and optimisation of your Google My Business profile, and implementing Search Engine Optimisation (SEO) measures to support them, so that your business can benefit from a privileged position among its competitors. 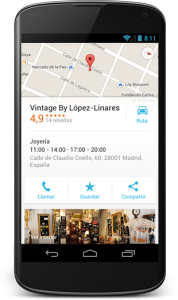 Maybe you need, or you have already, your business in Google Maps. Does it show up in Google Maps searches related with your products or services? Do you face too many competitors in your area? Perhaps you want to increase your relevance in a certain area, or improve your presence in mobile local Google Maps searches. Let me improve your presence and relevance in Google Maps. Your Google+ business page acts as a virtual business card for your online presence. It is linked to your Google My Business account and vice-versa. The information you provide in Google+, will affect wether your business is elegible to be shown in Google Search or not. This information has to be not only correct, but precise. Accuracy, and eg. positive reviews, will help raising your raking in Google Search. Let me help you improving the accuracy of your Google+ profile and your business information in internet. Google Search may show your business among the top results if your business information is accurately filled in in Google My Business, and your SEO ranking is strong enough. This increases your visibility and might even display an enriched profile of your business next to the Google Search results. So make you define and implement SEO strategies to increase the visibility of your Google My Business profile in Google Search.